SURREY, B.C. — Tears welled in Travis Lulay's eyes Thursday as he spoke about ending his CFL career. The veteran B.C. Lions quarterback had announced earlier in the day that he was retiring and said his message had been greeted by an overwhelming wave of support and well wishes. "I want to give it all back," he said. "I just appreciate the heck out of everyone who has touched this part of my journey in a meaningful way." Lulay spent all 10 years of his CFL career in Vancouver and lead the Lions to a Grey Cup in 2011, the same season he was named the league's most outstanding player. He stands third in club history in passing yards (21,252). A host of injuries forced him to the sidelines many times, including a torn knee ligament in 2017 that had Lulay contemplating retirement. After each injury, Lulay would balance his desire to continue playing with his desire to protect his body. This off-season, the balance shifted, the 35-year-old said. "The mental and emotional energy I put in to coming back, it just takes a toll," he said. "I genuinely tried to appreciate the moment. And maybe getting hurt has kind of increased that appreciation for me. The last four or five years of my career almost felt like a bonus." Some clubs made Lulay offers when CFL free agency opened earlier this month, and he thought carefully about getting back on the field this season. Ultimately, he chose to focus on his health and his family, including his wife, Kim, and their three young daughters. But the decision wasn't easy. "I'm looking at (the offers) and I'm going 'Man, there was a time when I couldn't get this kind of contract offer anywhere. And now I might be walking away from it,'" he said. "It really did make me stop and reconsider. But it also made me more and more certain that this was the right thing for me at this time." Spending a decade with a single CFL franchise wasn't something Lulay ever set out to do. The native of Aumsville, Ore., said he only brought a small suitcase with him to training camp in 2009 because he didn't know if he'd be driving home again in two weeks. "It is really special. To have been through so much, I've seen every avenue of this organization, from the best times, hosting and winning the Grey Cup … That was such an amazing time," he said. "And I've been through the rockier times of losing. I just feel really connected to this place." Last season, Lulay split the starting job with Jonathon Jennings, throwing for 2,494 yards and 13 touchdowns. Over his career, he compiled a 48-33 record as a starter, completing 63.5 per cent of his passes with 127 TD strikes. He also ran for 2,148 yards and 23 touchdowns. The former Montana State star registered either a .500 or winning record against every other team in the CFL. "He's left an indelible footprint on the league and I expect we're going to see great things from Travis in the days ahead," CFL commissioner Randy Ambrosie told reporters at the Lions' training facility in Surrey, B.C., on Thursday. "His life has been defined by his ability to make contributions and frankly, he's just a winner. He's somebody who approaches life in the most positive way imaginable." 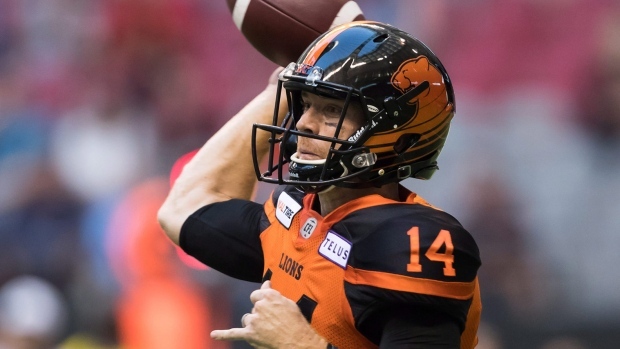 Earlier this month, the Lions signed Lulay's good friend Mike Reilly to a four-year, $2.9-million contract. The pair met nearly a decade ago when Reilly was Lulay's backup in B.C. and for months the friends have been talking frequently about their futures. Reilly said he was hoping they could reunite in the Lions locker room. "If we would have been able to have a working relationship again, that would have been amazing," he said. "I knew there probably wasn't a great likelihood of that happening." Knowing his friend was taking the helm made Lulay's decision to retire a bit easier. "I would have come to the same conclusion because ultimately it's my knee and my body that I'm doing this for in the future. But it would have been really hard if the Lions didn't feel really good about where they're at in the quarterback spot," he said. "To know that they're in more than capable hands with Mike, it feels pretty good." Reilly said Lulay has taught him a lot, including how to handle being the face of a franchise amid both success and failure. "To have a guy like him that I could call and lean on for support, advice, all those kind of things, it made my job much easier," Reilly said. One of Reilly's favourite memories of Lulay is being barefoot and in board shorts in Hawaii, tossing a football around on the morning of Reilly's wedding. "That's the type of stuff that I'll always hold on to because that will never end," he said. "We'll probably be 60 years old, out on a lawn somewhere, throwing routes for each other. And looking terrible doing it. But that's what you appreciate about a guy like Travis." For Lulay, relationships like the one he's grown with Reilly are the best part of his CFL career. While hoisting the Grey Cup in Vancouver stands out as the best moment on the field, it's the people that he'll have going forward. "I've got some really close friends … who mean more to me than the wins and losses," he said. As for what's next, Lulay said he isn't sure yet and will take as much time as he needs to decide. He's still interested in football, whether that means broadcasting or coaching or something else entirely. "I know I have opportunities," Lulay said. "It's just a matter of deciding where I want to go next."